American actor, best known for playing Paulie Pennino in the Rocky films. He also appeared in films such as Once Upon a Time in America, Mickey Blue Eyes, The Killer Elite, Convoy and Amityville II: The Possession. @Pierre: Burt has a very obvious camera advantage there. As I showed, Sly was an inch taller than Burt in that scene with half an inch less footwear when they were equal distance from the camera as I showed in the post directly below yours. There's no question Sly was taller than Burt by a minimum inch and judging by that scene, more like 1.5" when footwear is accounted for. @Sotiris: The repeatedly calling Sly "tiny" is getting a bit excessive, imo. Anyway, Sly was an inch taller than Burt with a half inch or so less footwear: Click Here Another wide shot with the same footwear and Sly still an inch taller: Click Here They were on stairs in the still you're posting: Click Here (Go to 1:22:11 to see they're on stairs) Whatever their heights, Sly has always been taller than Burt. With 5'9.5" listed Jack Nicholson from Chinatown: Click Here I didn't see 2" between them, especially considering Burt's posture. Burt = 5'8 , Macchio = below 5'8 at the time , De Niro = Lifts. He always had terrible posture, but some of the photos in the link Ron posted on Ralph Macchio page make 5'8" peak look believable to me. Click Here He didn't look more than 5 inches shorter than Carl Weathers in Rocky 3 either, imo. in rocky, sky looks to have an inch on him when sly and him are walking through the slaughterhouse. 5'6 will push sly on 5'7 what is wrong since he got more and less the same height than Kurt Russell 5'9 (we can see both walking barefoot side by side, same height in Tango & cash). We can guess Sly around 5'9 and maybe a little less like 174 and an inch less for young, so 171cm sounds quite good for me. To be honest, even the 70s I couldn't see 5'7.5, I guessed more 5'6 range but he was portly and I've not compared him really. Rob can you update with American actor best known for playing Paulie Pennino in the Rocky films. He also appeared in films such as Once Upon a Time in America, Mickey Blue Eyes, The Killer Elite, Convoy and Amityville II: The Possession. Sorry to keep saying "Rob" all the time LOL but if I don't say it I figured you're less likely to see it. I'm happy to use a different word we can agree specifically for flagging the update requests. How about "Chuck Norris" or something? Unless he lost a lot of height I doubt 5'6". Unless someone has a height scale on hand when meeting Mr young. I seriously doubt 5'3". That's bogus. I say he looked what sites have him as,between 5'7 and 5'8". Seemed a lot shorter like 5'3".I don't care how tall he was, he was a cool dude. In the final Rocky film,Rocky, and Paulie are walking to the fight next to each other and are exactly the same height. I disagree...walking in boxing shoes is like walking barefoot...so if burt young is 5.8...he's 5,9 with shoes on. If sly was in boxing shoes in that scene...it's normal that they are the same height since sly is probably around 5.9 now. Rob , what weight range do you think in Rocky ? Exactly jtm, so Stallone is no taller that 5ft 6in. absolutely.he looked it in the last rocky. I wouldn't be surprised if he's still 5'8" and has been since Rocky. this is still up? he was a strong 5-8 in 2001. Rob, he was barely shorter than Milo Ventimiglia in Rocky Balboa. There's no way he's only 5'6". Me neither. He may look shorter because of posture at times but 5-6? He's still likely above 5-7 and I see no reason to doubt that he was atleast 5-8 in his prime. he was 5-8 when i saw him in 2001.where this 5-6 comes from i dont know. He looked atleast 5-8 next to Carl Weathers in Rocky 3. Rick, that is a excellent story. Cugini means cousin in Italian. Can you share any thoughts Burt had about Stallone, height,personality? Yeah I like pretty much the entire Rocky cast. Burgess Meredith may have been my favorite. I agree that Burt was 5'8", probably 5'7" now. 5'6" seems too low. Burt is a great actor. He was close to 5'8" if not that when young. When Rocky punches the meat he's in Converse shoes(0.5"-0.6") and Burt is in boots( about 1.75"). Even with a probable 1.25" footwear advantage Burt looks over an inch shorter. Frank2: Have you ever met Burt Young? They never look the same but there are many, many scenes throughout the Rocky series where they are very close.Makes you wonder...He was 5'8" and yes totally has the body of a little man. In rocky 1 when stallone didnt have hes high heels on they looked about the same. What supermarket, you're making me hungry at 1:14am in the morn. Burt is just about 5 ft 8. He was in a film that I co-wrote: "Cugini". At the time he was working out alot with weights and a heavy-bag. He was actually managing a fighter at that time. He was built like a tank. He's a terrifiic guy by the way. I talked "Rocky" and "The Pope Of Greenwich Village" with him for over a month! 2001 it was.i was shocked he appeared even a hair over 5-8.i never expected him this tall either. rob-where did you get such a low 5-6? I agree with Glennjamin ! Rob this height is too low for Burt .. He was 5'8 for sure at peak and still a good 5'7 ! I see him every few months at the supermarket. He's in the 5'7" to 5'8" range. huh? looked 5-8 to me 6 years ago.he was for sure 5-8 peak.for damn sure. Rob , if Burt was 5'7.5 then , and 5'6 now .. then Talia Shire is more like 5'2 .. even in Rocky days ! 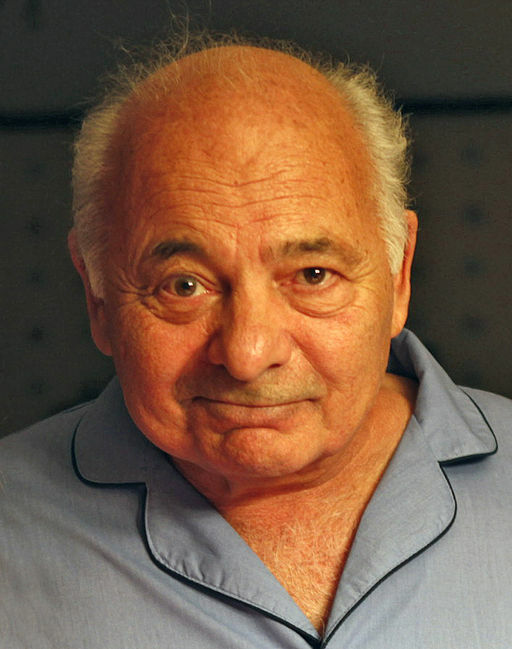 No way Burt Young is 5-7 and a half. He's gotta be like 5-4 or 5-5. Yeh this dude is about 5'4 to 5'5, he looks tiny in rocky. rob, yes indeed . 5'7.5 seems right on for him . now remember when i asked you about him and talia shire's height to help to pin down sly's real height and you said that talia really was about 5'4 ? in the rocky movies talia offten wears some type of heel . check her out next to burt young .